If you know me, you know I’m someone who likes things to be done easy and quickly. I don’t know if it’s my terrible laziness or the fact that I constantly feel run off my feet, but if I can get in and out of the kitchen in 30 minutes or less, I’m happy. Because I’m a stay-at-home-mom, I have the luxury of starting dinner (or it’s components at least) during the day as I have time. I understand that most of you don’t have that luxury so I still try to keep my recipes easy and the time it takes to do them to a minimum. I always think how I would do things if I only got home at 18h00 but wanted to eat at 18h30. I think, if I did work outside the home, I would be doing a lot of the prep work the night before so that I have less to do when dinner time comes and the kids need to be bathed and the husband wants to moan about his boss, you know? With this recipe, my suggestion is that you make the mince mixture the night before or the morning before you go to work (not that you have time, I’m sure), it really does not matter if you make it right before cooking it but this way, it’s one less thing to do and the flavours get to mingle a bit and the end result will just be that much more delicious. Just cover the bowl with plastic wrap so the mixture doesn’t dry out and pop it into the fridge. The rest can be done while the Koftas cook in the oven. 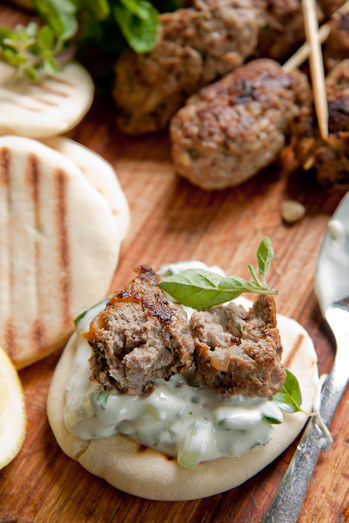 And if the Koftas sit around for a bit while you make the Tzatziki and toast the pita breads, all the better. 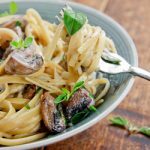 They’re better eaten at room temperature anyway.This meal is perfect as a snack with drinks or as a lunchbox filler as well. I often make more of the Koftas and just eat them for lunch the next day. At the moment, I’m working on a series of “Working mom” dinners so please let me know what you want/need from a recipe/meal and how much time you have to do it in. I know that I am one of the lucky few that get to cook throughout the day and have beautiful dinners ready by the time my family needs to eat but that is why I’d like to help you make your life a bit easier but still keep your family happy around dinner time (although honestly, with the terrible two’s around, I wish I had a full-day job sometimes) . The Tzatziki I made was just a variation on THIS RECIPE. I used a nice, thick Greek Yoghurt and added chopped mint, oregano and parsley. But feel free to use the recipe as it is. Fry the onion and garlic in a bit of olive oil until soft and translucent (about 5-7 minutes). Combine the lamb mince with all the herbs and spices in a large bowl and add the cooked onion and garlic. Add the egg and mix well. At this point you can cover the bowl and refrigerate or form the Koftas immediately. 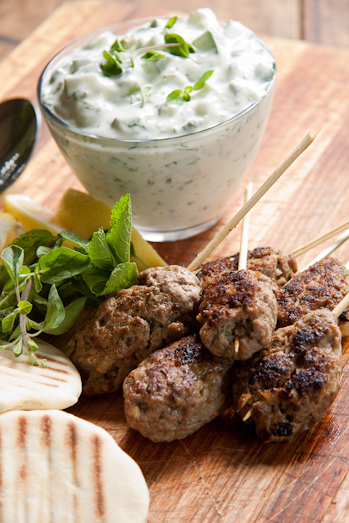 Form the lamb mixture into koftas (oval shaped meatballs) and place on a sheet of wax paper. Heat a few tablespoons of oil in a large frying pan and brown the koftas for 2 minutes per side. I like to serve my Koftas on kebab sticks so at this point I skewer them onto bamboo skewers and then place them on the baking tray. Place on a baking tray and place in the oven for 10-15 minutes until they are cooked. 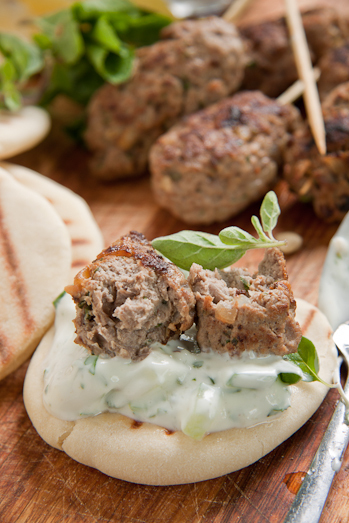 Serve the koftas with toasted pita breads and the chunky tzatziki. can you freeze these after they have cooked? I’m sure you could, I never have but I don’t see why it should be a problem. made these for dinner for guests with very few leftovers! We ground our own lamb and passed the cooked onions and garlic through the the grinder with the meat, as I don’t like big chunks of cooked onion. 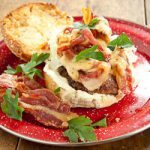 Very delicious and easy enough if have all the spices! Will definitely repeat!!! Hi, the cinnamon and cloves need to be powdered or can they be added as a whole? Meenu, they need to be ground/powdered. I am a new cook so this may seem silly. Is minced lamb the same as ground? My local grocer has ground lamb but I am sure I can get lamb minced I was just wondering if I could exchange. These sound wonderful. I was looking for something quick and easy to fix. It looks like I could make a huge batch and bag them up for the freezer. Have you tried that? Jenny, I haven’t but I’m sure it won’t be a problem. Hi! Looks great. How many koftas did this amount of meat result in? I’m looking to make around 55 smaller skewers for a party tomorrow, how many grams of meat would you count per skewer? Mona, I’m so sorry I’m only replying now. If you make the skewers about 50-100g each you’ll get between 10 and 20 with this amount. I just made this dish this morning and it was delicious. I found it on the South African magazine Crush! I just want to say thank you. I got to your site because I love middle eastern food, but I am so happy to stumble onto someone’s site who feels empathy for others and tries to put herself in someone elses moccasins. We seem to be short on the ability to imagine others’ reality these days. It’s so refreshing to see someone make the effort. Brilliant looking koftas – love the presentation on a stick, so much more classy than regular old meatballs..
Marisa, I love using the skewers. And it makes it a really easy way of serving it as a snack with drinks. Ally, that first paragraph is my life too! Whenever somebody makes the comment about me “not working” at the moment, I feel like saying something very rude back. Perfect timing, just yesterday I was dreaming about beautiful lamb like this but did not even know how to approach it. Thank you looks amazing. I just purchased a whole lamb from a butcher. I have ground lamb, will that work? Yep, that will be just fine.